I’ve been gluten-free for about five years and veggie noodles have now become a staple in my kitchen, but I will admit it was hard for me to venture beyond zucchini or carrot noodles at first. Frankly, I had never thought about using beets or squash, or any of the other dozens of veggies that can be spiralized. One day last year I came across Ali Maffucci’s blog, Inspiralized, and was immediately smitten with her ingenious use of a spiralizer to make all sorts of healthy recipes. And now Ali has a cookbook, also called Inspiralized , dedicated to veggie noodles and healthy eating. The book features 85 mouthwatering recipes and gorgeous pictures. Ali included some straight-up vegetarian and vegan recipes that look fantastic, and most of the others could easily be made vegetarian or vegan by omitting or substituting an ingredient or two. One thing I love about this book is how these spiralized veggies and fruit are turned into more than a plate of “noodles.” There are recipes for breakfast porridges, pancakes and waffles, even an “Everything Bagel,” that I’m dying to try next. The first recipe I decided to try was the Collard Hummus Wraps with Golden Beets and Sprouts. I really loved the idea of layering quick-roasted beet noodles with hummus, avocado, and sprouts. Wide, flat collard leaves are perfect for making wraps. Get a Copy of Inspiralized! Inspiralized: Turn Vegetables into Healthy, Creative, Satisfying Meals can be purchased on Amazon.com; you can also enter to win a copy of the book on the Marketplace through March 23! 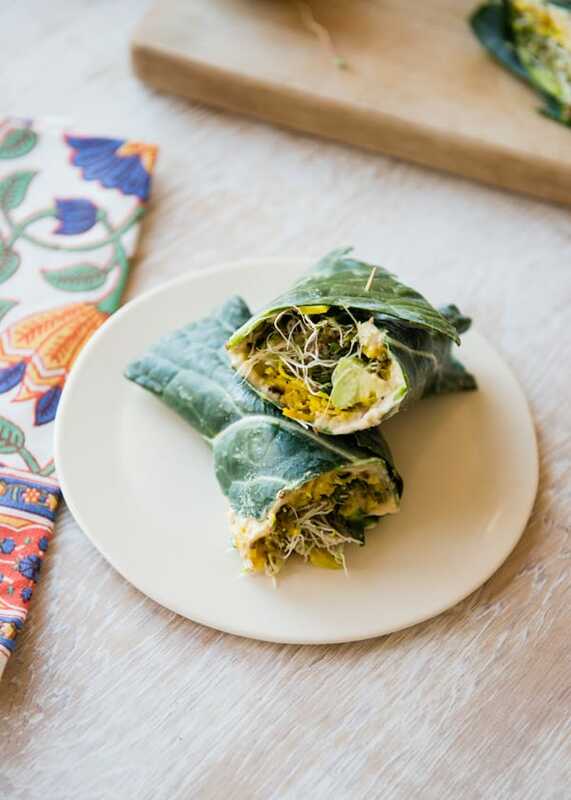 These healthy wraps from Inspiralized make a perfect lunch! Preheat oven to 400°F. Line a baking sheet with parchment paper. Spread the beet noodles in an even layer and lightly coat with olive oil cooking spray. Season with salt and pepper. Roast for 10 minutes or until softened, tossing halfway through. Lay the collard leaves on a clean, dry surface. Spread the center of each with about half the hummus, leaving a 1- to 1 1/2-inch border. Divide the beet noodles between the leaves, atop the hummus. Add 2 slices of avocado to each leaf, then top with alfalfa sprouts. Fold the sides in and roll the leaves up like a burrito. Slice each in half, and secure with toothpicks before serving. Thank you so much for the kind review! 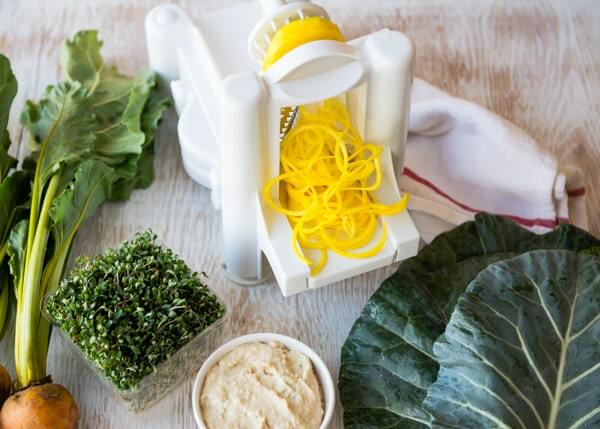 I’m so happy to hear that I’ve inspired you to try other veggies with your spiralizer! OH yum this looks wonderful! I imagine the sweet beets with the hummus is quite a great combination. Love the use of the collard wraps as well! I get a similar dish as one of my favorite vegan restaurants but never thought to make it at home. Thanks for sharing! That wrap looks really delicious! I’m so glad I stumbled upon your blog! I just made this and it’s sooo yummy! Last night I made your one-pot peanut sesame noodle and veggies and it was a hit even with my picky 3 year old.